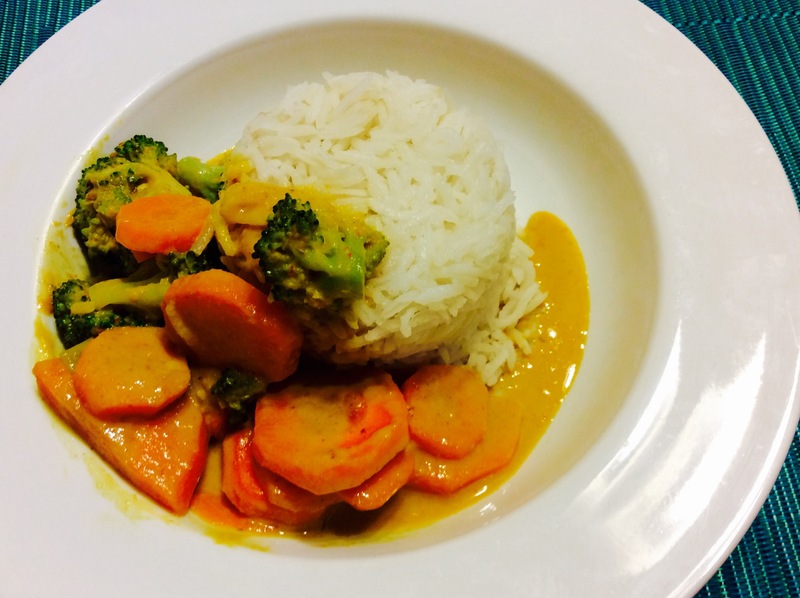 I have been a huge fan of Asian kitchen ever since and especially after my time living abroad in Singapore, I am desperately trying to figure out how to cook the perfect homemade curry. No master ever fell off the sky, hence figuring out how to do so cost me a lot of trial and error sessions. Well, like a perfect curry dish you usually get served at your favourite Thai restaurant: Perfect in its consistence, not overcooked and of course tasty (hot!). I tried various different curry pastes in the past (green, red and yellow ones), preferring the green one for dishes with chicken and the yellow one for veggie based recipes (carrots, broccoli, potatoes). At the beginning my curry didn’t turn out very tasty and looked more like a goulash stew thing (totally overcooked, what a fail!). Another time it turned out way to runny (fail again! ), finally making me realise that the right kind of coconut milk is the key to success.